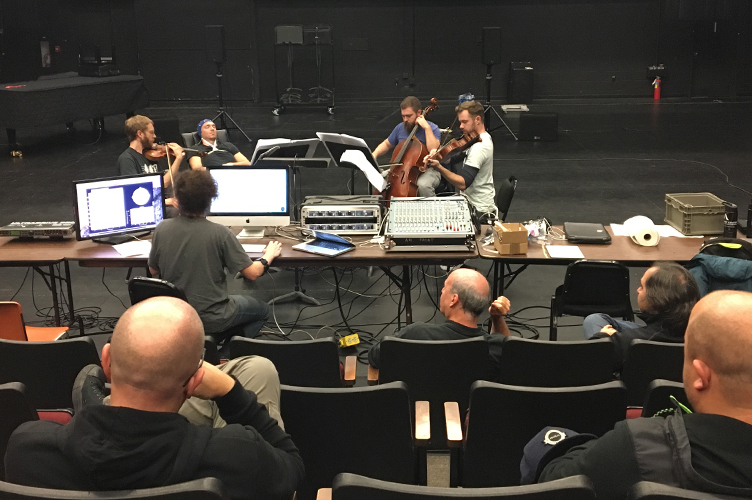 Earlier this year, the UW School of Music invited the JACK Quartet to participate in Meany Center’s Mellon Creative Fellowship program—a three-year project funded by the Andrew W. Mellon Foundation that will bring artists in music, dance, theater and digital arts to campus for extended residencies. JACK arrived in October for five days of collaboration with School of Music chair Richard Karpen and DXArts’ Juan Pampin. Much of the Quartet’s residency will focus on working with Karpen and Pampin on new compositions—and some of that work took the form of serious play. Assisted by DXArts Research Associate Marcin Paczkowski, the musicians decided to see what their brains “sound like” when thinking about, listening to, or playing music. Using a portable EEG machine (which measures electrical activity generated by the synchronized activity of thousands of neurons) they took turns wearing a “cap” of electrodes. These, in turn, recorded brain activity as patterns of voltage and transmitted the data to a computer which then ran it through software that transformed the fluctuations into sounds. At first, each musician experimented with thinking about something connected to movement—violinist Austin Wulliman, for example, thought about Slinkies. Other times, they tried clearing their minds and just focusing on their breath to see what sounds their thoughts might make. At one point Quartet members attempted to play while wearing the cap, but the machine is so delicate it recorded the player’s neck and face movements along with the signals coming from the brain, muddying the data. Things worked much better when a “JACK in the Cap” simply listened to the others playing—or even just imagined himself playing along with his fellow quartet members. The more they worked together, the more variation they achieved in the sounds they produced. This first phase was simply to experiment with what kinds of thoughts produce the most interesting sounds, and what the range of those sounds might be. When JACK returns in the spring, they are interested in figuring out a way to handle the controls themselves in order to manipulate the sounds their brain waves produce with the eventual goal of integrating these sounds into new work on which Juan Pampin and Richard Karpen are lead composers. In the meantime, they’ve requested a reading list to learn more about the brain before their next visit.